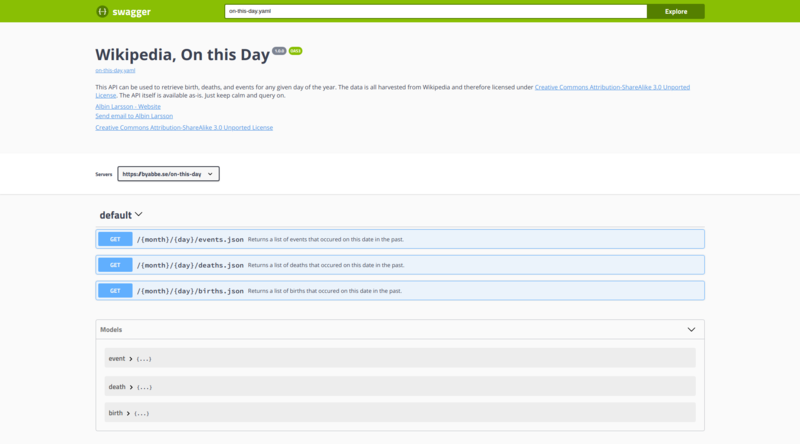 There are multiple “On this Day” APIs built on top of Wikipedia but I created yet another one. This API can be used to retrieve birth, deaths, and events for any given day of the year. The reason for building this was that I wanted something stable with support for things like Cross-Origin-Requests and SSL. The need wasn’t actually mine. A friend of mine sees the potential of “On this Day” information as a possible delighter in everyday contexts and I offered to help. The data is (because it’s harvested from Wikipedia) licensed under Creative Commons Attribution-ShareAlike 3.0 Unported The API is actually just a collection of pre-generated static JSON files cached and exposed using Cloudflare. So feel free to query without limits.